The first time Al Iaquinta met Khabib Nurmagomedov, in the last-minute main event of UFC 223, he had about 24 hours to prepare for the undefeated Russian juggernaut. While Iaquinta ultimately lost this fight by decision, he actually performed better than the vast majority of Nurmagomedov’s other opponents. Speaking on the latest episode of BJPENN.com Radio, Al Iaquinta explained why he’s so confident he could defeat Khabib Nurmagomedov in a rematch — particularly if the fight was preceded by an actual training camp this time around. 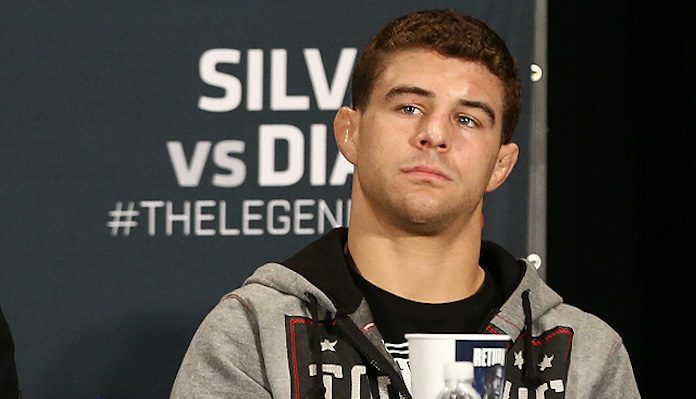 Al Iaquinta continued, assuring that even with a short training camp, he’s confident he has the ability to do what nobody else has done and hand Khabib Nurmagomedov a loss. While Al Iaquinta is confident in his chances in a potential Khabib Nurmagomedov rematch, his first priority is defeating Donald “Cowboy” Cerrone in the main event of UFC Ottawa on May 4. If he’s able to complete this mission, he’s hoping a title shot will be within reach. In fact, if he was in charge, a win over Cowboy would absolutely earn him a rematch with Nurmagomedov. Mind you, it sounds like the UFC would be a pretty interesting place if Iaquinta was at the wheel. “If I was running the show, I’d put [Conor] McGregor in there with Brock Lesnar,” he joked. Do you think we’ll see a rematch between Al Iaquinta and Khabib Nurmagomedov in the future? How do you think this rematch would play out?